1. 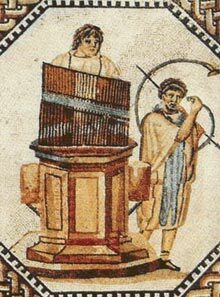 The concept of the organ dates back to an instrument called the hydraulis, invented in Ancient Greece in the 3rd Century BCE. A hydraulis was a mechanical instrument in which the wind pressure is regulated by water pressure. By the 7th Century AD, bellows replaced water pressure to supply the organ with wind.